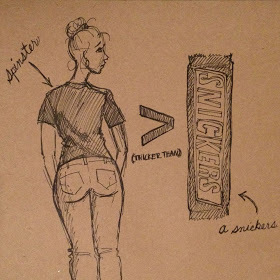 If you came up in the 90s you may be familiar with the phrase thicker than a snickers. Someone may get mad with me but the line between thick and obesity is wider than most choose to believe. Literally. It’s time to become more health conscious. I have been on both sides of the fence. Which is why I know that it’s more to it for most people who struggle with weight. It’s more like what is it that is eating the person. I’m an emotional eater. Once I realized what was going on I was able to work on the problem. Some men tell women that they want them to be thicker than a snickers but complain when they become big as a brick house. Look I want to be healthy and that’s the way that I am staying. Most of my family have the battled of the bulge. I am not being shallow it’s about my health. There are black women who do care about being fit because they want to be healthy. Thankful for the Keto diet it has changed my life. On a daily basis, I see some men who claim that they are not concerned about a woman’s weight when they should be. Women should look at men who say that they don’t care about her size. I mean what man wouldn’t want his lady to be healthy? Obesity is the leading cause of high blood pressure and diabetes. Less than truthful men disgust me because honesty is what’s best. Being healthy helps with not just being content with life but living well and living it to the fullest. Plus size clothing isn’t the only complaint but it’s one of them they don’t fit well and let’s not start on the different color patterns. Not downing anyone it’s hard to lose weight and keep it off. Losing weight helps with not just our physical state but our mental state as well.